Posted on April 15, 2013 by Susan H.
I just love waking up on a Sunday morning to freshly baked muffins…not to mention, so does my husband. 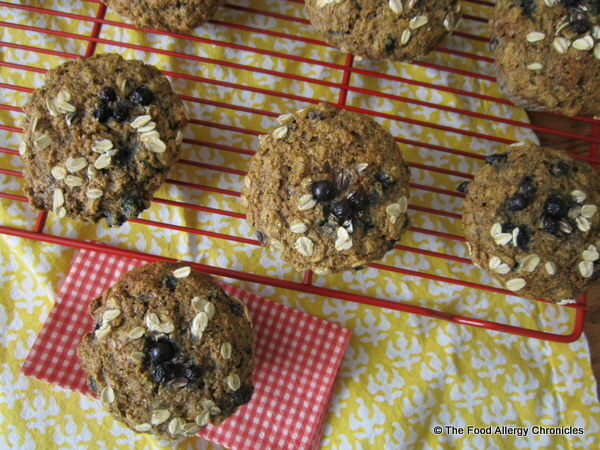 Big, bold crunchy tops adorn these beauties…Dairy, Egg, Soy and Peanut/Tree Nut Free 3 Grain Orange Blueberry Muffins. Just the ticket for this past Sunday’s sunny yet brisk morning. Prepping all the ingredients the night before makes swift work the next morning. 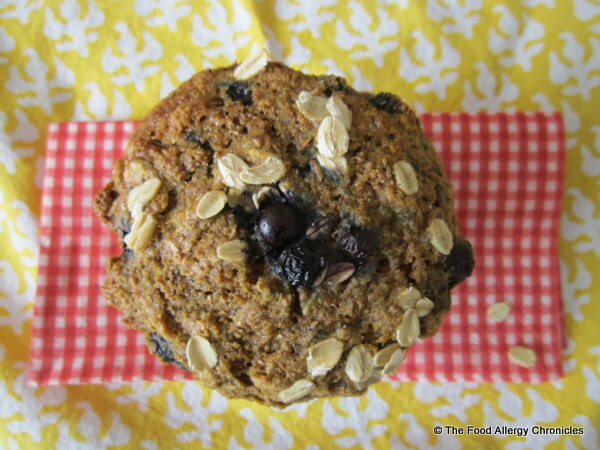 The blend of cornmeal, oats, whole-wheat and flax-meal lends to a more textural muffin…while the flavour combination of orange/blueberry brighten up this healthy combination of grains. Fresh from the oven, moist on the inside, crunchy on the outside…Andy couldn’t resist a second. I discovered this recipe back in the July 2004 issue of Chatelaine magazine…I have loved it ever since. Click here for the original recipe. Just a few adaptions were necessary to make this recipe allergen-free for our family. 1) 1 3/4 cups of Natur-a Rice Beverage or Natur-a Soy Beverage mixed with 2 tbsp. of white vinegar for the buttermilk. 2) an additional 1/2 tsp baking soda (added to the dry ingredients), 2 tbsp. of water (added to the wet ingredients) and 1 tbsp. of flax meal mixed with 3 tbsp. of water left overnight in the refrigerator (added to the wet ingredients) to replace the 2 eggs. As you must have noticed…I just love homemade muffins full of fruit and fibre…who knew there could be so many recipes? Lucky for me…and you…the list goes on and on for delicious muffins to adapt. 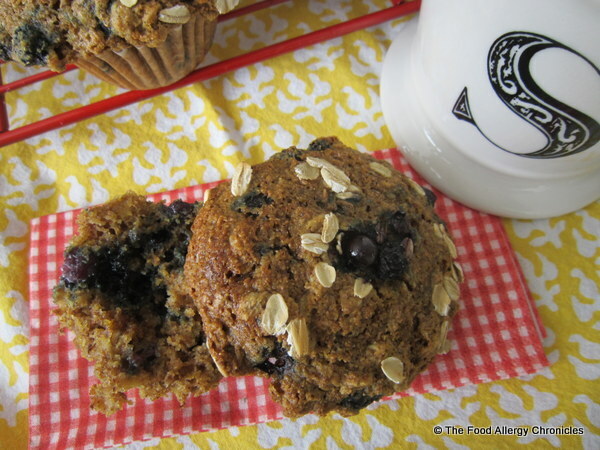 Perhaps I should start…Allergy Friendly Muffin Monday! What is your favourite type of muffin? Do you adapt it to meet you or your family’s allergies? This entry was posted in allergies, baking, breakfast, dairy free, egg free, muffins, multiple food allergies, oats, peanut/tree nut free, Snacks, soy free and tagged Chatelaine Magazine, Dairy Egg Soy and Peanut/Tree Nut Free Orange Blueberry 3 Grain Muffins, Natur-a Rice Beverage, Natur-a Soy Beverage by Susan H.. Bookmark the permalink. Sunday morning muffins….what a great idea! These look delicious! Did the boys like them also? Monday Morning Muffin Recipe Adaptation should definitely be “adopted”!!! Great idea. Cookies that I can actually eat. I’m so excited.